Religion is important to 72% in U.S., including 51% "very important"
WASHINGTON, D.C. -- As many Americans prepare to celebrate Christmas, 72% say religion is important in their lives, including 51% who say it is very important. Christians' attachment to religion is even higher, as 62% find it very important. How important would you say religion is in your own life -- very important, fairly important or not very important? 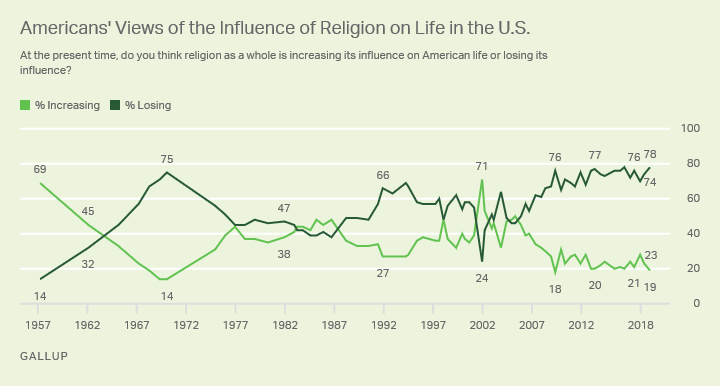 Although these findings, from a Dec. 3-12 Gallup poll, show that religion is still very important to a slim majority, they provide further evidence of the long-term decline in the importance of religion in Americans' lives. This decline has also been seen in Gallup's data on waning church attendance and self-identification with a particular religion. When Gallup first asked Americans to rate the importance of religion in their lives in 1952, 75% said it was very important and 20% fairly important. Those percentages were roughly the same when the question was next asked, in 1965, but by 1978, they had dropped to 52% very important and 32% fairly important. Since then, the percentage identifying religion as very important has fluctuated, rising above 61% in only two single readings: 64% in 2001 after the 9/11 terrorist attacks and 65% one year later. The historical low single reading of 49% was recorded in May 2015. Over time, Americans have generally been more likely to say religion as a whole is losing, rather than increasing, its influence on American life. 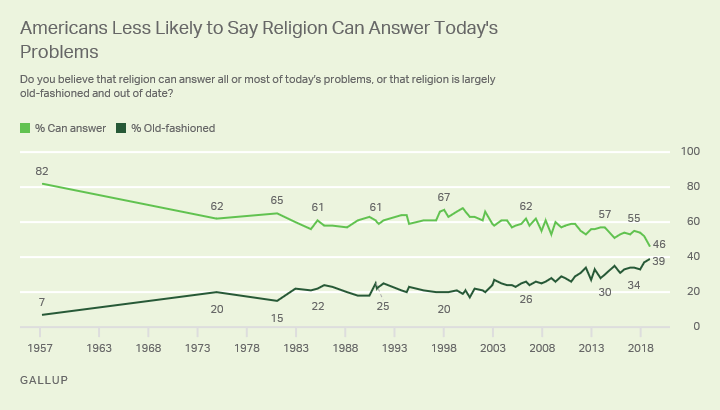 With the exception of three readings -- 69% in 1957; and 71% in December 2001 and 53% in March 2002 in the wake of the 9/11 terrorist attacks -- no more than half of the public has viewed religion as gaining influence. The current 78% of Americans who say religion is losing its influence on American life matches its historical high, recorded in May 2016. Neither Americans' frequency of church attendance nor their religious preference has much impact on their views of changes in religion's influence on U.S. life, with strong majorities of all groups saying it is losing influence. At the present time, do you think religion as a whole is increasing its influence on American life or losing its influence? As Americans' views of the importance of religion in their lives and its influence on American life have edged downward, so too has their belief that it can answer today's problems. For the first time in more than six decades, less than half of Americans, 46%, say "religion can answer all or most of today's problems." The public is now more closely divided than ever before in its views of religion as the answer to what ails society. 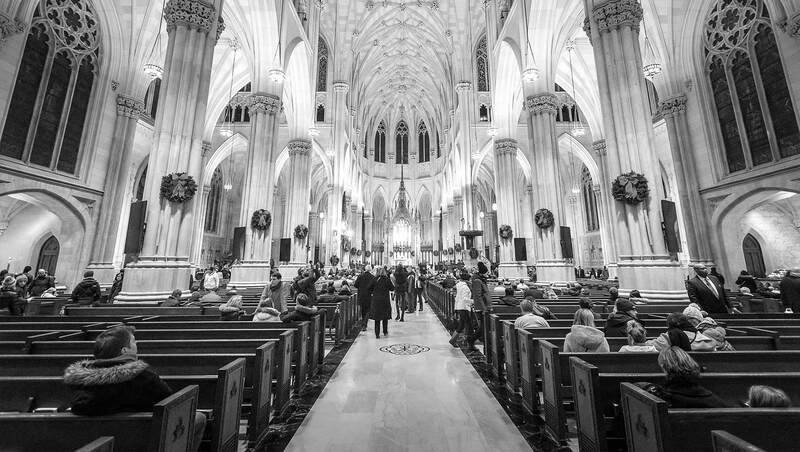 Unlike Americans' views of the influence of religion, opinions of religion as the answer to today's problems differ greatly based on frequency of church attendance. Among those who say they attend church every week, 81% say religion can answer most problems, compared with 58% who attend nearly weekly or monthly and 27% who attend less often than that. Likewise, Americans' views differ based on their religious preferences, with 63% of Protestants seeing religion as answering most problems and 46% of Catholics saying the same. However, 73% of those who do not identify with a religion take the opposite stance: that religion is old-fashioned and out of date. Do you believe that religion can answer all or most of today's problems, or that religion is largely old-fashioned and out of date? In recent years, Americans have been less likely to say religion is important in their lives, that it can answer the problems of the day, and that its influence on American life is increasing. Yet, despite these signs that religion is on the decline, religious leaders can be heartened by the fact that religion remains important to nearly three-quarters of Americans. And on this Christmas Eve, 62% of Christians in the U.S. consider religion to be very important. Results for this Gallup poll are based on telephone interviews conducted Dec. 3-12, 2018, with a random sample of 1,025 adults, aged 18 and older, living in all 50 U.S. states and the District of Columbia. For results based on the total sample of national adults, the margin of sampling error is ±4 percentage points at the 95% confidence level. All reported margins of sampling error include computed design effects for weighting. The Southwest and Southeast regions remain the most religious in the U.S., while the Pacific and New England regions are the least religious. Americans' confidence in institutions is broadly stable, but organized religion has sunk to another low while big business and banks have recovered slightly. 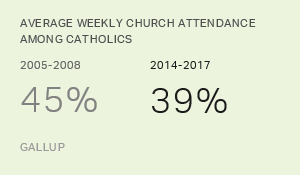 After stabilizing in the mid-2000s, weekly church attendance among U.S. Catholics has resumed its long-term decline. Protestant attendance remains steady.